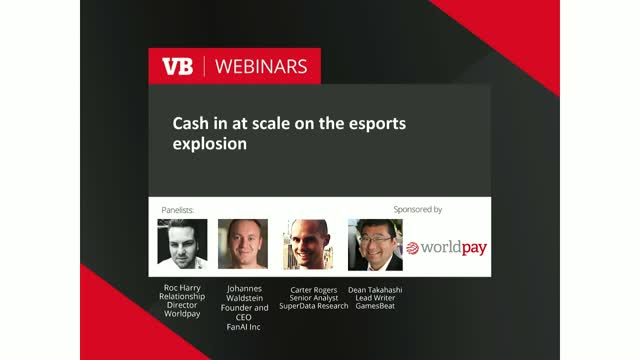 The esports market is on fire. Last year 43 million people watched the League of Legends world championships, a multiplayer fighting game. And it's not a niche market of teenage boys in basements. A recent report found that 31 million people watch esports tournaments in the U.S., and more than double that -- 68M -- in China. And the question is -- how do you monetize that at scale? Look to the wild success of the Asia-Pacific esports companies. The companies who stage events like China’s 2017 Riot Championships, which posted more than 32 million viewers, have been able to compel customers to actually pay to view content, and even tip players, with the right streaming and payment technologies. Don’t miss this VB Live event for keen insights from leaders in the space on how U.S. companies can effectively operate globally or begin to expand globally. You’ll learn how to confront the challenges that scaling your audience can pose and improve it, from west to east, as you look to capture more of the global audience opportunity. * Johannes Waldstein, CEO, FanAI Inc.